Give ear O heavens, let me speak; let the earth hear the words I utter! May my discourse come down as the rain, my speech distill as the dew, like showers on young growth, like droplets on the grass. (Devarim 32:1). listen, for these words are meant for you. *Saʻadiah ben Yosef Gaon (882/892 – 942) was a prominent rabbi, Jewish philosopher, and exegete of the Gaonic period. He was born in Egypt and died in Baghdad. The first important rabbinic figure to write extensively in Arabic, he is considered the founder of Judeo-Arabic literature. Known for his works on Hebrew linguistics, Halacha and Jewish philosophy and his philosophical work Emunot veDeot represents the first systematic attempt to integrate Jewish theology with components of Greek philosophy. He was also very active in opposition to Karaism, in defense of rabbinic Judaism. This day is the birth of the world… from the Rosh Hashana Machzor. darkness gives way to the rays of the sun. morning sparkles on undulating waves. an intricate interplay of light and dark. dangling crystals trembling in the breeze. today is the birthday of the world. Tradition teaches that Rosh Hashana is actually the day believed to be the anniversary of the creation of Adam and Eve, the first man and woman. God then told them of their role in His world. Their creation was the culmination of the work of the five preceding days. from earth’s terrain to God. The usual biblical word for angels (or messengers), “mal’achim” does not actually appear in the prayer, which addresses “ushers of mercy; ones who cause prayers and outcry to be heard before God; ones who bring our tears before God.” Clearly we are asking intermediaries who are understood to be angels, to intercede for us. (Even today, there are shlichei tsibbur who change the words slightly so as not to be perceived as praying to angels). Here is a link to a contemporary rendition of Machnisei Rachamim by Odeliah Berlin https://www.youtube.com/watch?v=yXgW8j48NqA. *Selichot are Jewish penitential poems and prayers, especially those said in the period leading up to the Yamim Nora’im and on Fast Days. God’s Thirteeen Attributes are a central theme throughout these prayers. Selichot are usually recited between midnight and dawn. Some recite them at night after the evening service or in the morning before the morning service due to the convenience of synagogue attendance at these times. Arguably the most important and certainly most popular night of Selichot in the Ashkenazi tradition is the first night, when many members of the congregation attend the late-night service on Saturday night. The chazzan wears a kittel and sings elaborate melodies. In some congregations, it is not unusual for a choir to participate in this first night’s service. This night also has more Selichot than any other night prior to Rosh Hashanah eve. The other nights are more sparsely attended and those services are often led by a layperson, rather than a trained musician, and with melodies that are less elaborate than the first night. These ancient prayers for forgiveness are already mentioned in the Mishnah. A later Midrashic legend associates King David with the establishment of a special service for forgiveness when he discovers that the Temple will be destroyed. “How will they reach atonement?” he asks God and learns that the people will recite the Selichot prayers and then be forgiven. And I, I will surely hide My face on that day… (Devarim 31:18). and gently asks her why. gave up and went away. My children search for Me no more. This story is told of Rabbi Dov Ber (the Maggid) of Mezeritch* who was a disciple of the Baal Shem Tov. He perceived the child’s friends who gave up on her because she was so well-hidden, as a metaphor for God’s people who give up looking for Him and start to live their lives without Him. And God is pained when they no longer seek Him out. Based on the phrase, “Va’anochi haster asteer panai – And I, I will surely hide My face on that day,” the Ba’al Shem Tov teaches that the repetition of the word “I” means that even in the hardest times of (God’s) concealment, the “Anochi – I” will still be there. That, he says, is God’s promise, that He will not desert us in times of trouble. *Rabbi Dov Ber ben Avraham of Mezeritch (1700/1704/1710 – 1772) was a disciple of Rabbi Yisrael Baal Shem Tov, the founder of Chassidic Judaism, and was chosen as his successor to lead the early movement. Rabbi Dov Ber is regarded as the first systematic exponent of the mystical philosophy underlying the teachings of the Baal Shem Tov, and through his teaching and leadership, the main architect of the movement. He established his base in Mezeritch (in Volynia), which moved the center of Chassidism from the Baal Shem Tov’s Medzhybizh (in Podolia), where he focused his attention on raising a close circle of great disciples to spread the movement. His inner circle of disciples, known as the Chevraia Kadisha (“Holy Brotherhood”), included his son Rabbi Avraham HaMalach (The Angel), Rabbi Nachum of Czernobyl, Rabbi Elimelech of Lizhensk, Rabbi Zusha of Hanipol, Rabbi Levi Yitzchak of Berditchev, Rabbi Baruch of Medzhybizh, Rabbi Aharon (HaGadol) of Karlin, Rabbi Menachem Mendel of Vitebsk, Rabbi Shmuel Shmelke of Nikolsburg and Rabbi Shneur Zalman of Liadi. These disciples, being themselves great Talmudic authorities and well-versed in Kabbalah and Chassidic philosophy, were successful in turning Chassidut into a vast movement. After R’ Dov Ber’s death, avoiding the unified leadership of the first two generations, this third generation of leadership took their different interpretations and disseminated across appointed regions of Eastern Europe. Under the inspiration of their teacher, this rapidly spread Chassidism beyond the Ukraine, to Poland, Galicia and Russia. His teachings appear in his own books and in the works authored by his disciples. **Rabbi Abraham Joshua Heschel (1907 – 1972) was a Polish-born American rabbi and one of the leading Jewish theologians and Jewish philosophers of the 20th century. He was descended from preeminent European rabbis on both sides of his family. After a traditional yeshiva education and studying for Orthodox rabbinical ordination semicha, Rabbi Heschel pursued both a doctorate at the University of Berlin and a liberal rabbinic ordination, studying under some of the most eminent Jewish educators of the time. He joined a Yiddish poetry group and in 1933, published a volume of Yiddish poems. In late October 1938, while living in a rented room in the home of a Jewish family in Frankfurt, he was arrested by the Gestapo and deported to Poland. He spent ten months lecturing on Jewish philosophy and Torah at Warsaw’s Institute for Jewish Studies. Six weeks before the German invasion of Poland, he left Warsaw for London. His mother and three of his five siblings were murdered by the Nazis (his father had died when Heschel was nine). He reached New York City in 1940 and in 1946 took a position at the Jewish Theological Seminary of America (JTS) in New York City, the main seminary of Conservative Judaism. He served as professor of Jewish Ethics and Mysticism until his death. Heschel explicated many facets of Jewish thought, including studies on medieval Jewish philosophy, Kabbalah, and Chassidism. According to some scholars, he was more interested in spirituality than in critical text study. Heschel believed the teachings of the Hebrew prophets were a clarion call for social action in the United States and worked for African Americans’ civil rights and against the Vietnam War. Heschel is a widely read Jewish theologian whose most influential works include Man Is Not Alone, God in Search of Man, The Sabbath, and The Prophets. At the Vatican Council II, as representative of American Jews, Heschel persuaded the Roman Catholic Church to eliminate or modify passages in its liturgy that demeaned the Jews, or referred to an expected conversion to Christianity. His theological works argued that religious experience is a fundamentally human impulse, not just a Jewish one. He believed that no religious community could claim a monopoly on religious truth. ***Martin Buber (1878 – 1965) was an Austrian-born Israeli Jewish philosopher best known for his philosophy of dialogue, a form of existentialism centered on the distinction between the I–Thou relationship and the I–It relationship. Born in Vienna, Buber came from a family of observant Jews (he was a direct descendant of the prominent 16th century rabbi, R’ Meir Katzenellenbogen, known as the Maharam of Padua) but he broke with Jewish custom after a personal religious crisis: he then started reading Kant, Kierkegaard, Nietzsche. The latter two, in particular, inspired him to pursue studies in philosophy. In 1896, Buber went to Vienna to pursue secular studies in philosophy. In 1902, he became the editor of the weekly Die Welt, the central organ of the Zionist movement, although he later withdrew from organizational work in Zionism. In 1923, Buber wrote his famous essay on existence, Ich und Du (later translated into English as I and Thou), and in 1925, he began translating the Hebrew Bible into the German language. In 1930, Buber became an honorary professor at the University of Frankfurt am Main, but resigned in protest from his professorship immediately after Adolf Hitler came to power in 1933. He then founded the Central Office for Jewish Adult Education, which became an increasingly important body as the German government forbade Jews to attend public education. In 1938, Buber left Germany and settled in Jerusalem, receiving a professorship at Hebrew University and lecturing in anthropology and introductory sociology. In the beginning of Parashat Nitzavim, Moses asserts that all of the community will enter into the covenant with God. He continues with a list of all those present, in descending order of social status, ending with menial laborers, represented here by the woodcutters and water drawers. The mention of these specific workers has aroused the interest of commentators through the generations. Are these merely two similar examples and is there also some deeper meaning? In the former case, we are talking about simple, unlearned folk, at the bottom of the social pyramid. Rabbi Baruch of Medzhybizh* teaches that the whole of the community is greater than the sum of its parts, and although each Israelite might be flawed, all together their strengths and good qualities are magnified. The message then is that each individual member of the community is personally committed to the Covenant (not through the action of someone superior) and that each is equally worthy. Chassidic lore abounds with stories in praise of poor and simple folk who are valued as much as their wealthier, more learned peers. The Nachalat Yitchak** commentary on the phrase “mechotev etsecha ad sho’ev maymecha – [literally] from the hewer of your wood to the drawer of your water,” notes that whenever we see “from…to,” the meaning is from the greatest of the great to the smallest of the small. He brings several proof texts (as in Shemot 11:5, “From Pharaoh’s firstborn to the firstborn of the maidservant,” and others). So the Nachalat Yitzchak wonders what is the distance here between the woodcutter and the water drawer – as both of them are ostensibly of equal status. He suggests, in the name of Rabbi Meir Shenipsker** who cites the Sifrei,*** that although the month of Elul is a time of grace for repentance, more so than the rest of the year, it is hinted here that one shouldn’t even wait until Elul proper but rather try to repent early, from halfway through Av. This is derived from the Talmud (Ta’anit 31) regarding Tu be’Av – the fifteenth – or halfway through Av). This is the implication of “from your woodcutters” – because on 15th Av the time that the cutting of the wood for the main altar in the Temple was completed for the year. Significantly, this is when the nights – traditionally the ideal time for Torah study – lengthen again after the summer solstice, permitting more study. It is taught that increased Torah learning should intensify repentance and good deeds. As to “until your water drawers,” we learn that this refers to Hoshana Rabba which marks the end of the water drawing and water libation ceremonies (which took place during the intermediate days of Sukkot). Hoshana Rabba is traditionally the last day one can still alter the verdict for the New Year. An interesting idea is raised by Rabbi David Nelson in an article on Nitzavim entitled, An All-inclusive Covenant, http://www.myjewishlearning.com/texts/Bible/Weekly_Torah_Portion/nitzavim_clal.shtml. He notes that when Moses lists the categories of people, we find most can be sorted into pairs of opposites: young/old; men/women; leaders/strangers. The menial workers – water drawers and woodcutters do not seem like opposites – both were menial, not highly-regarded workers. Rabbi Nelson suggests that we free-associate. “Perhaps these jobs are meant symbolically rather than literally. Woodchoppers are literally “choppers of your trees.” The image of trees has echoes of the Tree of Life, the Torah. To “chop” such a Tree is to question, or reject Jewish tradition. 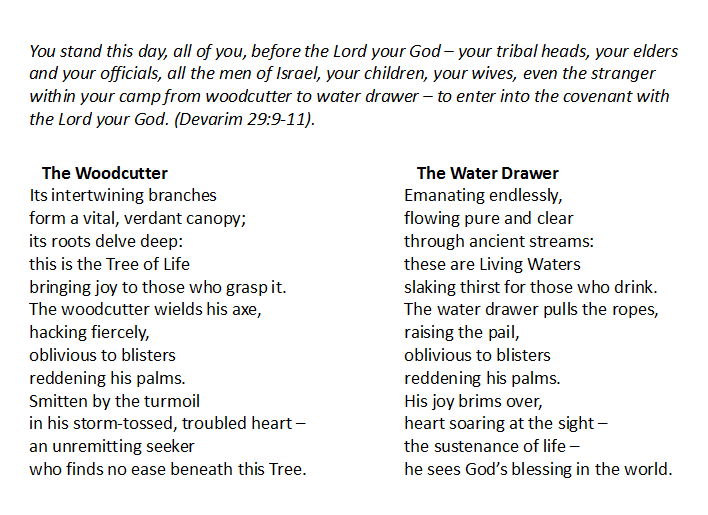 On the other hand, the image of “water-drawers” is reminiscent of the verse “u-sh’avtem mayim b’sasson mima’ayanei ha’yeshua – you shall draw water joyfully from the wellsprings of salvation.” (Isaiah 12:3). The image is of one who drinks deeply from the wellsprings of Torah.” Rabbi Nelson concludes, “Understood this way, Moses is declaring the covenant to be inclusive of all, the pious and the rebellious, the faithful and the confused. The text warns us never to be so complacent about our commitment or devotion, or so sure of our faith, that we see the covenant of Israel as closed to those who are not convinced of its value or sure of its feasibility. Rather we must learn from the later verses of the parashah and approach such Jews with the assurance that the Torah, in its broadest sense, “… is very close to you, in your mouth and in your heart.” (Devarim 30:14). Dr Aviad HaCohen, in a D’var Torah on Parashat Nitzavim from 2005 http://www.kipa.co.il/jew/pash/85/7049.html, brings a variation on the contrast between woodcutter and water drawer. He cites various commentators: the S’forno who says there is a hierarchy in every society so even in this lowest social stratum, there is a pecking order, “from the first of the woodcutters to the last of the water drawers.” Rashi and Ramban believe that these were Canaanites who came to convert in the days of Moses and even though they were yesterday’s “other”, having accepted the covenant, they came to stand before God with all of Israel. However, Dr HaCohen quoting his late uncle Rabbi Shmuel Avidor in his book, Likrat Shabbat, suggests that there is an important difference between the work of these two laborers. The woodcutter, he says, uproots and destroys, damaging Nature and its beauty. The water drawer brings up water from the deep springs, which nurtures man, as well as the flora and fauna. He adds that even the body movements of the two laborers is significant. Whereas the woodcutter bends away from the tree as he increases the power of the blow, the water drawer bends forwards towards the well or spring as he tries to bring living water to nourish the world. Dr HaCohen concludes that the difference then, is not one of stature but of essence. The former represents those who would destroy and uproot, while the latter represents those who nurture and enhance the world. Both, he says, come before God on the Day of Judgment and must give an accounting of their actions. *Rabbi Baruch of Medzhybizh (1753–1811), was a grandson of the Baal Shem Tov. He was the first major “rebbe” of the Chassidic movement to hold court in Medzhybizh in his grandfather’s hometown and Beit Midrash, which he inherited. R’ Baruch was known for his melancholy, fiery temper, and uncompromising strong will. His teachings were the subject of great debate among the Chassidic leadership of his generation. He was the first Chassidic leader to accumulate great wealth from his devotees through the practice of petek and pidyonot. In other words, he obtained donations and gifts for personal requests or prayers. He claimed to his followers that he had supernatural powers derived directly from his blood-connection to the Baal Shem Tov. His followers numbered in the thousands when he died. **Nachalat Yitchak, Rabbi Meir Shenipsker are both cited in Itturei Torah, on this verse. I cannot find any information about either. ***The Sifrei refers to classical Jewish Biblical exegesis, based on the biblical books of Bamidbar and Devarim. The priest shall take the basket from your hand and set it down in front of the altar of the Lord your God. the promise of harvest blessed by the Source. as once we bore dough when we hastened from Egypt. we called out to You and You answered our cry. wrought wonders and miracles, bringing us home. to the Levite, the stranger, the poor and bereft. tendered like first fruits, soar back to the Source. Parashat Ki Tavo opens with a description of one of the most beautiful ceremonies of Temple times: the bringing of the “bikurim – the first fruits.” The rite is first mentioned briefly in Sefer Shemot (23:19 and 34:26) but in Ki Tavo, it is described much more fully. The Mishna in Masechet Bikurim, portrays the festive observance of this mitzva in Temple times. The description starts with the farmer noticing the first cluster of grapes or figs, marking it with a band and declaring, “These shall be for first fruits…” and concludes when he leaves the Temple having brought his offering. The Rambam, in his Laws of First Fruits, adds further details. One of these is that the first fruits can be conveyed in any manner, but once the Temple Mount is reached, the presenter himself must carry the basket on his shoulder, even if he is the king. In his book, Passages:Text and Transformation in the Parasha, Rabbi Michael Hattin addresses the significance of carrying on the shoulder. He brings other biblical examples: Rebekka at the well; the Levites carrying the holy vessels of the Mishkan during the wandering in the wilderness; and most strikingly, the children of Israel carrying their dough and their kneading troughs, wrapped in their garments when they hastily departed Egypt. Rabbi Hattin suggests that when carrying on the shoulder is described in the Torah, it is associated with a situation in which the load must be borne aloft until a suitable resting place is found. He says, “In the context of the first fruits, then, the significance of carrying the basket is not simply to convey it from one’s field to the Temple, but to actually relive the existential journey from homelessness to settlement! We must carry the bikurim because we are symbolically re-experiencing the dispossession of our ancestors who had no land. We bear the basket on our shoulder because we are recalling their condition of anxious destitution, of having meager possessions and nowhere to rest them.” Rabbi Hattin further points out that the word “tenneh – basket” appears only four times in the Tanach, all of them in this parasha, as opposed to the more common word, “sal” which occurs fifteen times. He says tenneh is etymologically related to the Aramaic word for burden or load. Much has been written about the declaration which each person bringing the bikurim is obligated to make. This declaration, the “mikra bikurim – the declaration made over first fruits,” includes the section which begins, “My father was a fugitive Aramean…” and has become one of the best known passages in the Torah because, although originally said on Shavuot, which is “Chag HaBikurim – the Festival of First Fruits,” in post-biblical times it became a central element of the Haggadah on Seder night. The mikra bikurim is essentially an encapsulation of the nation’s history, and each person is enjoined to remember the affliction of slavery and disenfranchisement, and then to rejoice in the liberation by God and the gift of the land of Israel. The final part of the declaration mentions enjoying the God-given bounty with the stranger and the Levite. In his book, Orchard of Delights, The Ohr Chadash Torah Commentary, Rabbi Avraham Arieh Trugman, quoting Rashi who describes a man going down into his field and spotting the first fruits of that year, says that on a mystical level, this refers to a person’s soul descending to enter a physical body in order to fulfill his purpose, declaring, “This is the first fruits.” Rabbi Trugman comments that this is a fundamental Chassidic concept, that the soul must descend in order to ascend. Taking the first fruits up to the Temple represents the elevation of the physical world. He adds, “The Ba’al Shem Tov compares gathering and preparing the first fruits with redeeming sparks of holiness scattered throughout reality as a result of the breaking of the vessels. Furthermore, he explains that bringing the sparks up to Jerusalem symbolizes returning the sparks to their Divine source.” Rabbi Trugman draws a parallel between the farmer’s declaration describing exile and redemption, with the scattering and redemption of the holy sparks in Kabbalistic thought.